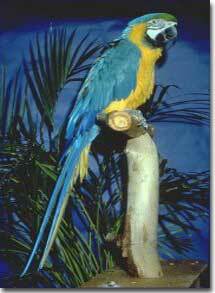 Blue and Gold macaws, Ara ararauna, are probably the most prevalent of the large parrot family known as macaws. Blue and Gold macaws are spectacularly beautiful with glowing bright blue bodies, brilliant orange breasts and tiny black facial feathers that run like rows of stitches across their facial patches of white skin. They have small black bibs under their chins, and a splash of green just above their beaks. As adults, Blue and Gold macaws have pale yellow eyes, and their beaks are solid black. From head to tail they can range from 34 to 36 inches in length. They originate in Central America and northern South America in Colombia, Venezuela and Brazil. Blue and Gold macaws weigh between 900 to 1200 grams. Blue and Gold macaws typically have nice personalities - enthusiastic without being high-strung, calm at times, physically affectionate, even-tempered, all-around good birds. They are usually physically affectionate with people they know and trust. They enjoy deep head skritches and may roll on their backs for tummy rubs now and then. When I think of Blue and Gold macaws in human terms, they are the ones who were reasonably good students in high school and went on to trade school. They are solid citizens. They are not prone to being nippy, although of course any bird can bite, and a nippy Blue and Gold can be quite dangerous. Blue and Gold macaws are intelligent and interested in what is going on around them; they are one of the easier macaws to work with and can be trained to do many tricks. They love praise and attention, and are quite proud of themselves when they accomplish something new. Blue and Golds are very social and need a great deal of attention and playtime. Unfortunately for them, Blue and Golds love to express themselves with their voices. They are just so happy to be alive! You can hear it in their voices. On the positive side, they are more inclined than most other macaws to develop a relatively large vocabulary. On the downside, their propensity to loudly vocalize is the number one reason they lose their homes. These beautiful blue and yellow parrots are one of the most moderately priced of the large macaws. They are readily available and tend to make great family pets. However, as with any parrot, children and birds should not be left unsupervised. With their boisterous, energetic personalities it is important for them to have large cages, separate play stands and lots of toys available to keep them happily occupied.